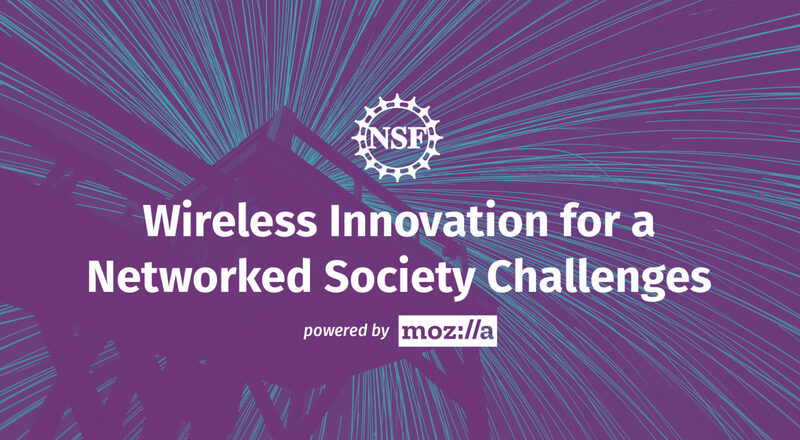 Today, Mozilla is announcing the National Science Foundation-sponsored Wireless Innovation for a Networked Society (WINS) Challenges: two U.S.-based competitions with $1 million in prize money each. The goal: support creative, open-source ideas for making the Internet more accessible, decentralized and resilient. The challenges seek prototypes and designs that either a) provide connectivity during disasters or b) connect the unconnected. Mozilla believes in the power of collaborative solutions to tackle big issues. Running open challenges has proven to be an effective instrument — not only to identify a broader set of solutions, but also to broaden the dialogue around these issues, to build new communities of problem-solvers and to strengthen the global network of people working toward a healthier Internet. The program will begin accepting submissions in June 2017 through our soon-to-launch website, and will culminate in fall 2018. You can sign up for related challenge events below, or sign up for more information. Off-the-Grid Internet Challenge. When disasters like earthquakes and hurricanes strike, communications networks are among the first pieces of critical infrastructure to overload or fail. How can we leverage both the Internet’s decentralized design and current wireless technology to keep people connected to each other — and vital messaging and map services — in the aftermath of a disaster? Challenge applicants will be expected to design both the means to access the wireless network (i.e. hardware) and the applications provided on top of that network (i.e. software). Projects should be portable, easy to power and simple to access. Here’s an example: A backpack containing a hard drive is wired to a computer, battery and Wi-Fi router. The router provides access, via a Wi-Fi network, to resources on the hard drive like maps and messaging applications. Smart Community Networks Challenge. Many communities across the U.S. lack reliable Internet access. Sometimes commercial providers don’t supply affordable access; sometimes a particular community is too isolated; sometimes the speed and quality of access is too slow. How can we leverage existing infrastructure — physical or network — to provide high-quality wireless connectivity to communities in need? Challenge applicants should account for a high density of users, far-reaching range and robust bandwidth. Projects should also aim to make a minimal physical footprint and uphold users’ privacy and security. Here’s an example: A neighborhood wireless network where the nodes are housed in, and draw power from, disused phone booths or similarly underutilized infrastructure. These challenges are open to a range of participants: individuals, teams, nonprofits and for-profits. Applicants might be academics researching wireless networking; technology activists catalyzing local infrastructure projects; entrepreneurs and innovators developing practical solutions for people who need (better) access; makers aiming to have an impact locally; or students and educators exploring networks and community activism. The challenges consist of two stages. First is the Design Concept Stage, for ideas that have been thoroughly researched and designed. Second is the Working Prototype Stage, for projects ready to prototype and demo (applicants must complete the Design Concept Stage in order to advance to the Working Prototype Stage). Applicants have opportunities to win prize money during both stages. 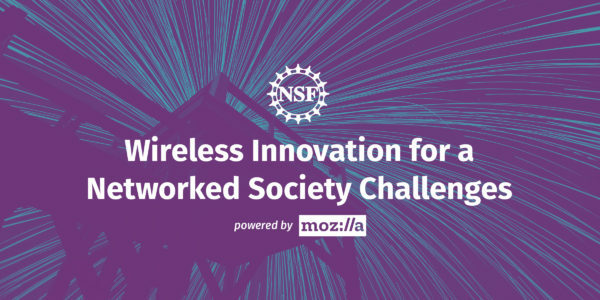 Judges selected by Mozilla with input from the NSF will select winners. Judges — experts from academia, NGOs and the business world with expertise in technology, research and community activism — will assess projects based on a range of criteria, like creativity, affordability, social impact and adaptability. This spring, Mozilla will host a series of events — from Raleigh to Oakland to NYC — to foster collaboration and attract applications. Launch events will be free and open to the public.